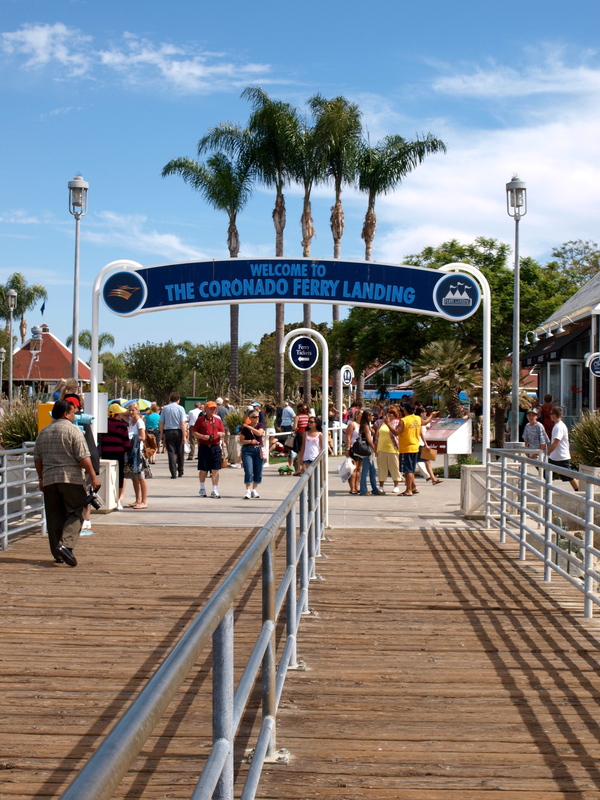 Technically this is the “Old Ferry Landing” Pier but to most it’s simply the Coronado Pier or Ferry Pier. 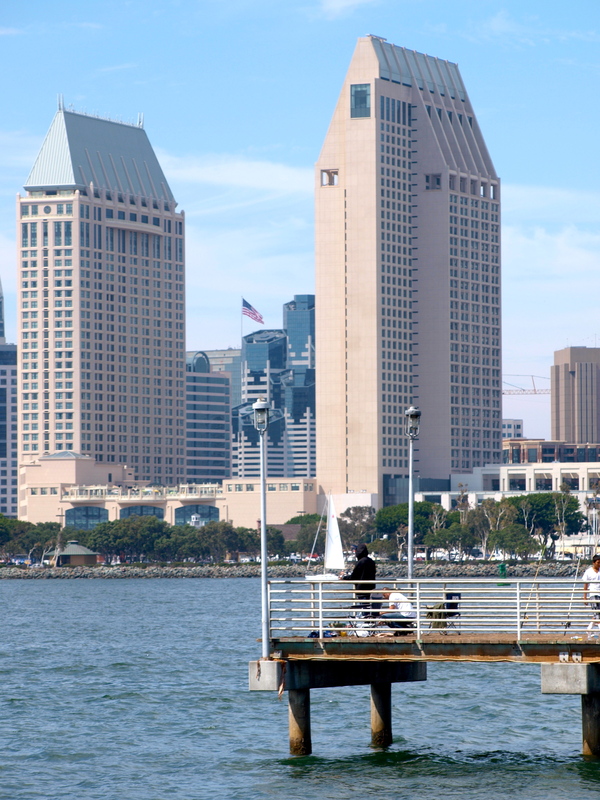 I spotted this small pier one day from the downtown side of San Diego Bay. 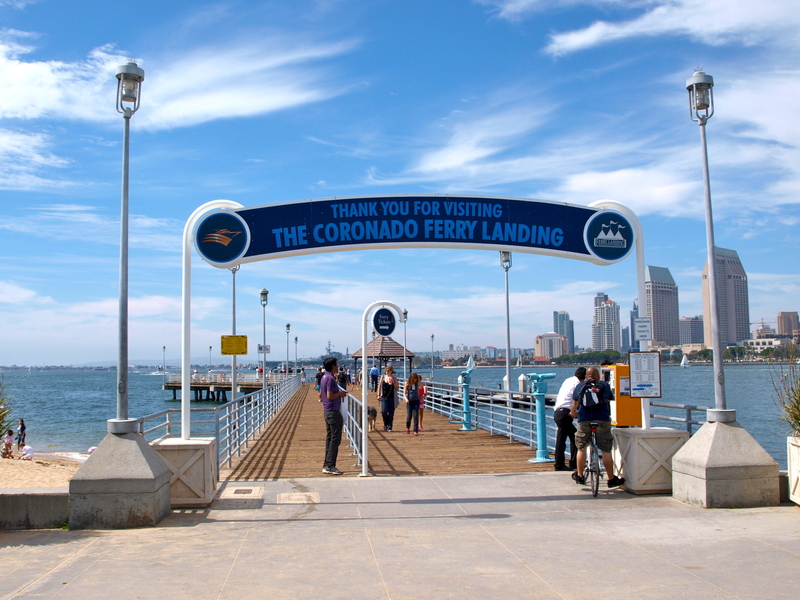 I drove across the Coronado Bridge, was unable to find the pier and left it out of the first edition of Pier Fishing in California. Later, I found directions to the pier and could have kicked myself because it is so easy to reach. It sits behind a shopping complex and although completely hidden by the shops, it’s a short, easy walk from the corner of the street. 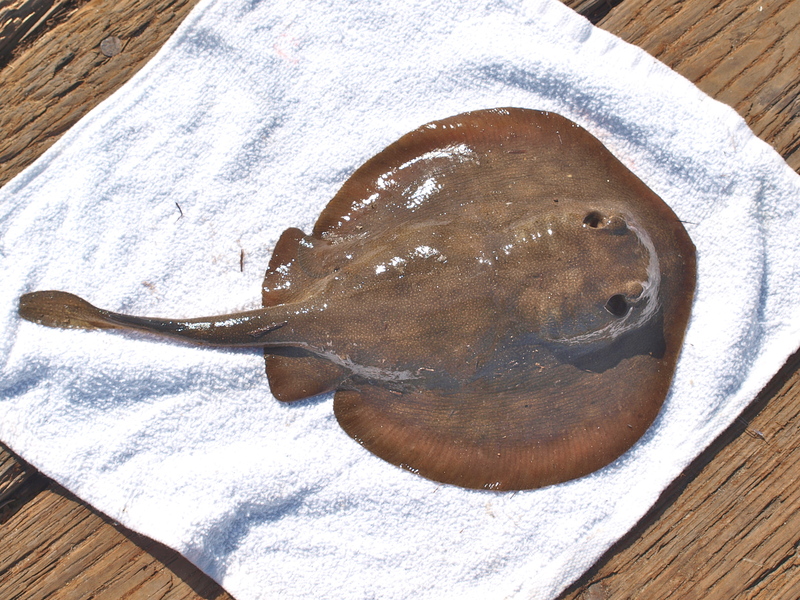 I do sometimes wonder if the pier could use a change in name— to “Stingray Central.” I have rarely had a trip to the pier when I haven’t caught at least one round stingray, and I average more than two of the fish per trip. It doesn’t seem to matter what bait I am using on the bottom—bloodworms, ghost shrimp, squid or pieces of fish like mackerel—the small rays will find the bait. Environment. The pier is small (377 feet long) and although part of it is a boarding area for the ferry, the part that is open for angling yields quite a few fish. 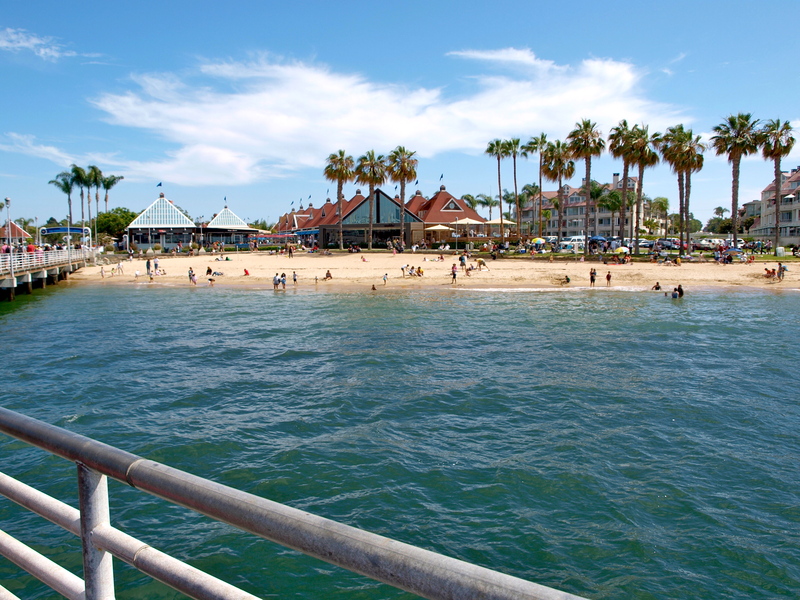 The bottom here is primarily sand and mud with several grassy areas around the pier, especially on the shore side of the pier. The pilings themselves are somewhat encrusted with fish attracting mussels. At the right of the main pier section sits the landing for the ferry and a lot of fish like to hang under that landing. 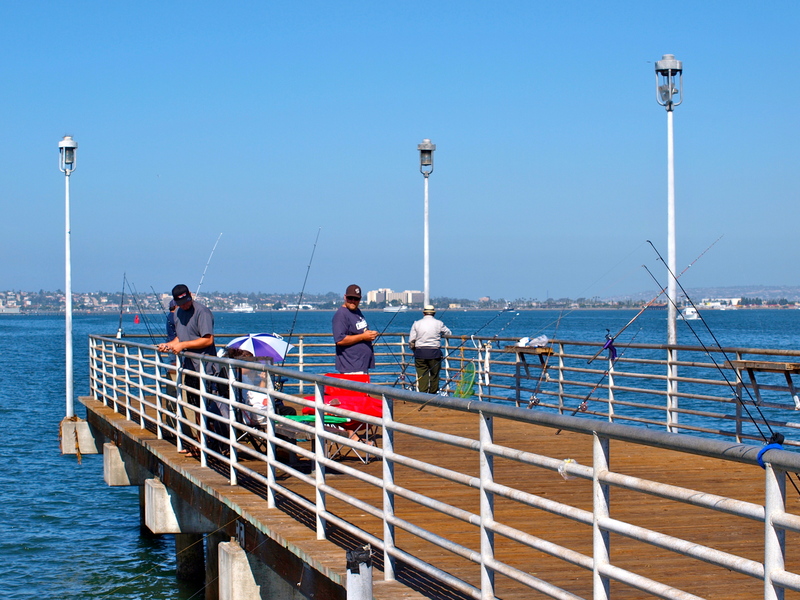 Because of the pier’s size, the water depth is fairly shallow but because of the grassy areas quite a few bass—sand bass, spotted bay bass and kelp bass—seem to be caught. Fish. 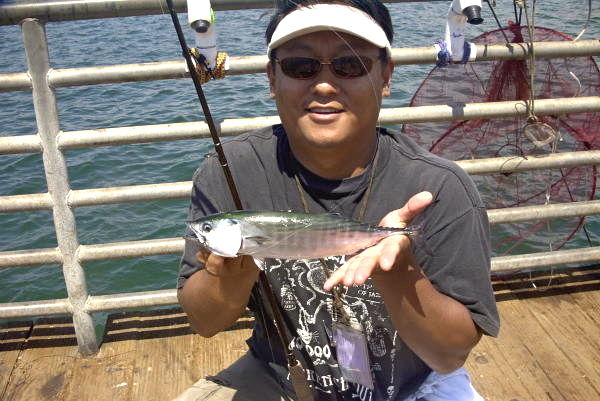 The overall mix of fish mirrors, for the most part, that of most piers located in southern California bays: jacksmelt, topsmelt, mackerel, and (some years) bonito on the top; bass, perch, croakers, halibut, turbot, rays and sharks on the bottom. Initially I thought that the pier would yield less mackerel and bonito than piers near deeper water. But I was wrong! The water is plenty deep on the bay side, is often good for mackerel, and is at least fair for bonito during the years when they make an appearance. 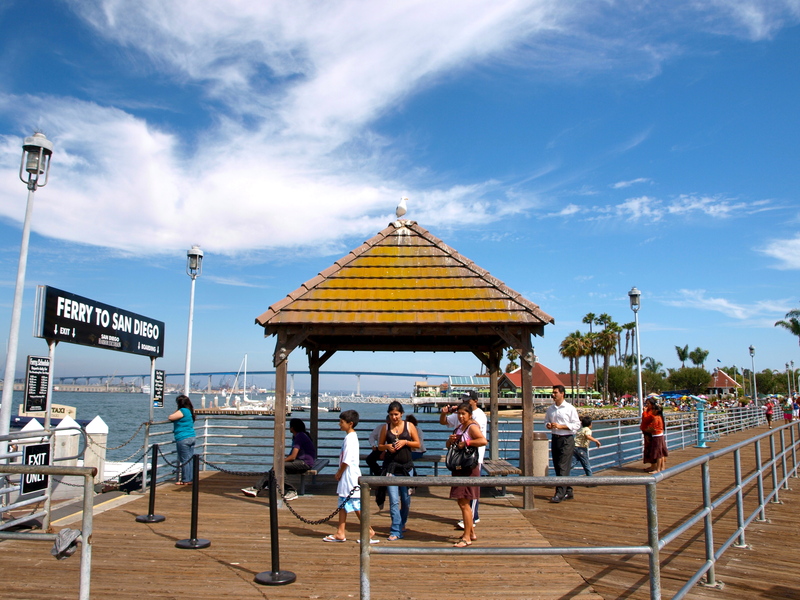 In addition, the waters in South San Diego Bay are noted for quite a few warm-water, Panamic Province species, fish more common to Baja south. Numerous Cortez bonefish (Albula gilberti) have been landed and shortfin corvina (Cynoscion parvipinnis) are an increasingly common catch. A banded guitarfish (Zapteryx exasperata) was caught in August of 2002, a big California butterfly ray (Gymnura marmorata) was landed in September of ’02, and a speckled midshipman (Porichthys myriaster) was taken in May of ’06. Of course the latter is perhaps not that unexpected given the number of Navy personnel in the area. 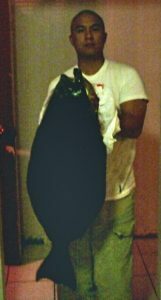 A fish becoming more and more common is the giant (black) sea bass. A baby of around 30 pounds was landed (and released) from the pier in May of 2009 and almost every year since has seen at least one of the illegal to keep fish. In September 2016, a lucky angler landed a finescale triggerfish (Balistes polylepis). Why lucky? Because they are a rare fish to catch in the bay and because they are also one of the best eating fish. Of course their super tough skin (almost like rawhide) can dull even the best knife. Fishing Tips. Several different approaches can be tried here. First is to buy an umbrella drop net. Attach a few pieces of bread to the net, drop it down into the water, and catch yourself some small smelt or anchovies. Then, using the live bait, fish directly under the pier (or off the far left corner) on the bottom for halibut. Or, try in the grassy areas for barred sand bass, spotted sand bass and kelp bass. Try near the landing dock for bass in both quantity and quality. 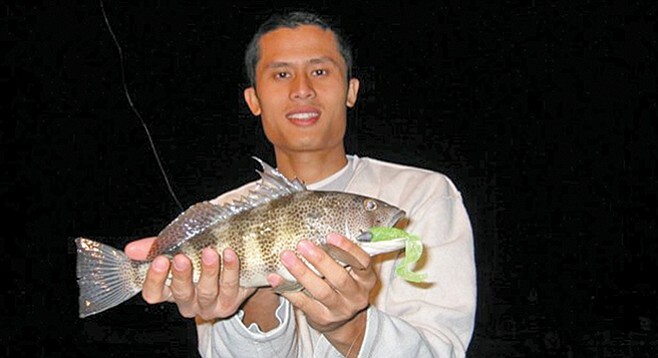 During the spring, try fishing in the grassy areas with bloodworms, mussels or ghost shrimp for blackperch, white seaperch, rubberlip perch and sargo. Fishing on the bottom or mid-depth, while using small hooks, size 6 or 8, and pieces of anchovy or mackerel, will sometimes also yield herring (queenfish) or tomcod (white croaker). Salema are also a frequent visitor. At night this can be a good pier for sharks and rays. 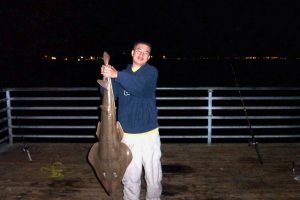 Casting out away from the pier and using mackerel or squid as bait, will often result in gray smoothhound sharks, leopard sharks, bat rays, shovelnose sharks (guitarfish) and a few thornback rays. As mentioned, this pier, both day and night, also yields a lot of stingrays. Although I caught one of the larger and less common diamond stingrays (Dasyatis dipterura) in a visit in July of 2007, the vast majority of stingrays will be the smaller-sized round stingrays (called stingers and teacup saucers by some of the PFIC regulars). Handle them with care but return them to the water. Nocturnal hours are also very good for the croaker clan—spotfin croaker, yellowfin croaker and an occasional black (China) croaker. A close relative, sargo, can also be included in the gathering. For these, use a high/low rigging on the bottom and use bloodworms, mussels or ghost shrimp as your bait. Another croaker, the shortfin corvina , is (as mentioned) becoming a somewhat common catch at the pier. Although recorded north to Huntington Beach, shortfin corvina are fairly rare to California waters preferring the warmer waters to the south in Baja. 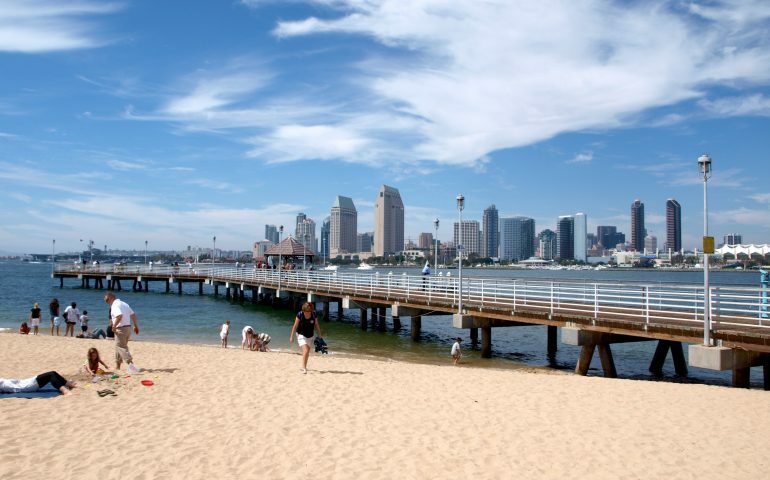 Recent studies seem to show that a population exists in south San Diego Bay. Most shortfins are taken at night, especially during the warmer-water summer months, and both baits and lures (including top-water plugs, Fish Traps, Big Hammers, and Berkley Gulp Minnows in pink or green—among others) are used to capture the toothy croakers. The shortfin corvina should not be confused with white seabass or corbina, two other croaker species found in these waters. 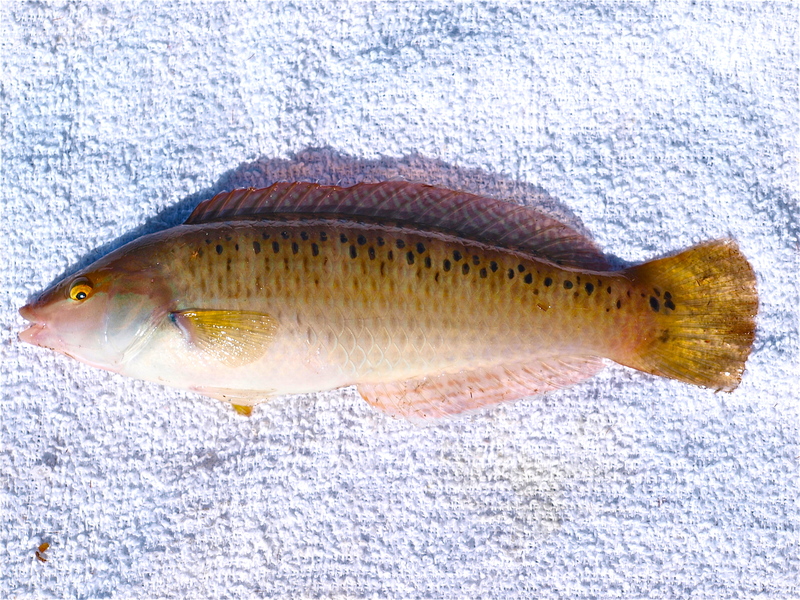 Nor should they be confused with the orangemouth corvina, the large corvina once so common in the Salton Sea. Just to add to the confusion, don’t mix ‘em up with their other giant brethrens—totuava, red drum (channel bass), or black drum, all fellow members of the distinguished croaker clan. And, thinking in ways most strange, I wonder what a tartan of the croaker clan would look like? For mackerel or jacksmelt try a multi-hook bait rig, i.e., Sabiki or Lucky Lura. Cast out, let the line sink part way to the bottom and then start a slow but steady retrieve. If the mackerel are wary, switch from the bait rig to a single hook. Put a size 4 or 2 hook on the end of your line and add a split-shot sinker or twist-on sinker three foot above the hook. Keep your bait 6-8 feet under the surface of the water (and you may find that you also need a bobber or float to do it). The key is to get the bait down to the mackerel that like to hang under the schools of smelt. The smelt will attack the bait and nibble it with their small mouths but then the mackerel will rudely barge in and grab it. When the mackerel are around you should have no problem catching a stringer of fish. If Pacific bonito make a showing, artificial lures seem to offer your best chance for success. A plastic Cast-a-Bubble with a trailing feather (yellow and green are primo) about 3-4 feet behind often yields the best results. Barracuda will also sometimes also show up, generally in the late afternoon or evening hours, and again an artificial lure, a chrome jig like a Kastmaster or Krocodile, often proves best. Rich Reano, the webmaster for the Pier Fishing in California web site, and once a reporter for the pier, says he has even seen barracuda taken here on Salas iron jigs. This is also a pier that seems to see a lot of California needlefish (Strongylura exilis), prey that are fun but difficult to catch. If you want to seek these, use live bait fished under a bobber or float, and cast just out from the pier. Use a size 6 hook and expect to lose at least a half-dozen baits for every needlefish that you hook. Some also suggest a strip of squid fished much like a lure; cast out and retrieve quickly. Lures will, of course, also take several other species. Perch will sometimes hit a soft plastic grub, while spotted sand bass, barred sand bass and kelp bass will strike many different types of lures. Favorites include small 3-5 inch Scampis and Scroungers, Haddock Kreepy Krawlers and Berkley Power Sand Worms. Swim baits are also popular as well as more exotic combinations like swim baits with a rattle added, and Strike Lites—a lure designed to be used at night. One hint is to use freshwater jig heads that have smaller hook diameters since they are sharper. A good technique to try when using artificials around the pier is to drop the lure straight down alongside the pier. Let the current sweep it under the pier, wait a few seconds, and then begin your retrieve. Often the fish will hit it as the lure is descending to the bottom or when you begin the retrieve. Or, you can try a lift and fall technique since you are somewhat limited in the area you can fish. 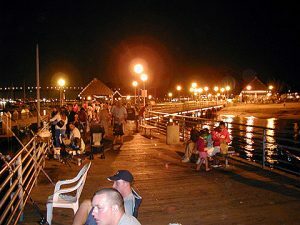 The key is to keep the lure around the structure of the pier, do not work the lure away from the pier.